Dhrupad vocalist Amelia Cuni forges an uncanny blend of traditions with this original interpretation of John Cage's 18 Microtonal Ragas: Solo 58, a cycle of 18-scale patterns from the collection Song Books (1970). An Italian-German performer and composer trained in both European experimental music and the classical Hindustani art of dhrupad, Cuni contextualizes Cage's use of melodic modulations and rhythmic cycles within one of the oldest and most refined idioms of Indian performance practice. 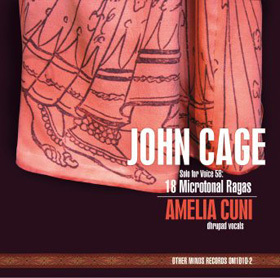 John Cage wrote his 18 Microtonal Ragas after years of immersing himself in Indian music and philosophy. Nearly forty years later, Italian-German dhrupad singer Amelia Cuni, with extensive training in both the European and Indian classical traditions, interprets this work that could have been written for her special artistry. 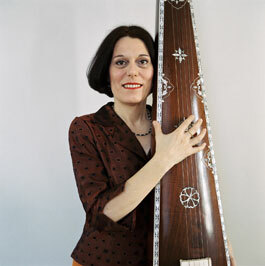 On this CD she performs the complete Solo 58 from Song Books, combined with numerous performances of other solos from the same collection, with percussionists Raymond Kaczynski and Federico Sanesi, and Werner Durand establishing both the traditional Indian drones specially created to accompany the microtonal ragas, and performing on electronics. During the 1940s, John Cage came in contact with Indian music and philosophy and started applying some of its principles to his own work. Indian thought influenced Cage’s music mostly on a conceptual, theoretical level, but these 18 Microtonal Ragas represent an exceptional and uniquely practical example of Cage’s own approach to this rich and stimulating musical tradition. “Solo for Voice 58”, 18 separate and independent parts, is an indeterminate work; the challenge for the performer is to develop ragas out of tonal material which has been composed non-traditionally. This apparent contradiction has been the driving force behind Amelia Cuni’s intensive engagement with this work for the past few years. Cuni first performed this Solo during the rendition of John Cage’s Complete Song Books at the Theater Bielefeld in Germany in May 2001, in collaboration with Christian Kesten and the new music vocal ensemble Die Maulwerker. She then went on to deepen her involvement with this unusual work, feeling that this was a unique opportunity to further her own understanding of the relationship between tradition and experimentation, confronting East and West in a process of de-conditioning perfectly fitting her personal history as a European dhrupad singer. John Cage uses the word raga (melodic module) and tala (rhythmic cycle) in his directions for Solo 58, so the pieces are treated as such, although they do not echo any traditional Indian raga because of several musicological divergences. These discrepancies trigger a vast series of questions and challenges to the common understanding of Indian music. They introduce a valuable outsider perspective and suggest possible future developments for an ancient but lively tradition.